At least a half a dozen secret informants helping British agents wage war on powerful Colombian drug cartels died because of blunders and mismanagement by their handlers, a whistleblower has claimed. Insiders recruited by covert officers to provide invaluable information on the multi-billion pound cocaine-smuggling barons were failed by â€œdysfunctionalâ€ and â€œrecklessâ€ behaviour, it was alleged. In a rare insight into secret anti-drug missions carried out throughout South America, one former counter narcotics officer claimed inadequate safeguards unnecessarily placed innocent lives at risk. He stated that informants were tortured and shot while confidential statements given to British officers, and handed to â€œtrusted Colombian officialsâ€, were leaked to the drug cartels. The Customâ€™s officer, known only as Mike, claimed that at least six informants died between 2000 and 2004, as a result of British operational mismanagement. “I feel that the decisions made, and the rules I was forced to follow in the handling of some people, resulted in their deaths,â€ the whistle-blower told Channel 4 News. He told of another incident, in which an informant turned up at the British embassy six months after disappearing with four gunshot wounds to his torso and another to his mouth. Mike, 47, who now lives at an undisclosed location overseas, has been left so traumatised by what he experienced in Colombia, doctors have diagnosed him as permanently disabled. The officer, who was in charge of a â€œsignificantâ€ network of about 50 â€œsupergrassesâ€ throughout the region, won a record Â£790,000 payout from the government earlier this year, as a result of his trauma. â€œI want to sleep at night. I donâ€™t want to feel guilty the way I do,â€ he added. In its investigation, to be broadcast on Thursday night, the programme claimed â€œdrugs liaison officersâ€ carried out operations from their base at the British embassy in the Colombian capital Bogota. Operations were first headed by HM Revenue and Customs before responsibility was handed to the Serious Organised Crime Agency (SOCA), which was founded in 2006. The government declined to comment last night on the nature of the operation or how much money is spent in the region. But one former British informant, code-named â€œMercedesâ€, said he was paid $60,000 (Â£38,000) in 2000 for information that led to a tonne of cocaine being seized from the port city of Cartagena, located on the Caribbean coast in the countryâ€™s north. Two years later the informer, â€œJesusâ€ â€“ not his real name â€“ claimed that a confidential statement he had given to his British handlers, and handed to a â€œtrusted Colombian officialâ€, was then leaked to a drugs cartel. A few days after he made the â€œhighly sensitive statementâ€, he was confronted by a trafficker, who had a full copy of the document who said he would be killed. â€œ(They got) all that I wrote â€¦ every single page,â€ he said. Jesus, his wife and four children were placed under a British witness protection programme in July 2002, but a few months later returned to Colombia because they felt â€œisolatedâ€. Governments across the world have been engaged in a high-profile war on drugs in recent years. It is thought that Colombia is the source of nearly three quarters of the cocaine that is sold on British streets. Last year the worldâ€™s biggest drugs and money laundering “super cartel” was smashed in Colombia after dozens of members of a powerful cartel, including two alleged major kingpins, were arrested and charged. Officials believed the gang were responsible for almost half of the cocaine on American streets, or more than 912 tonnes with an estimated street value of more than $24 billion (Â£16.2 billion). 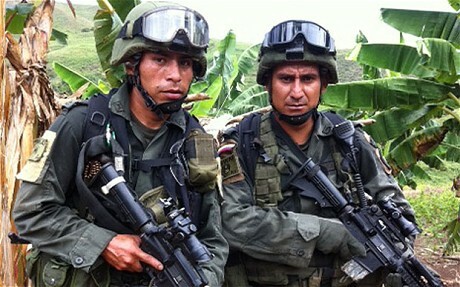 The drug cartels buy coca from Colombia’s peasant farmers for about Â£250 a pound. After being refined into cocaine, the same quantity can then be sold for about Â£15,000 in Europe. It was seen as a significant boost to the American governmentâ€™s high-profile war on drugs, after Barack Obama, the US President, announced a new push against central and South American drugs cartels. A few days earlier, Antonio Maria Costa, the U.N. drug and crime tsar warned that international crime syndicates posed a growing threat to global security. In a joint statement, a spokesman for SOCA and HMRC said on Wednesday night: â€œIt is long-standing â€¦ policy not to comment on operational matters.â€ He declined to comment further. * The full report can be seen on Channel 4 News on Thursday night.